Oahu weather patterns are some of the most stable in the entire state. Unless you head mauka (inland) you're not likely to experience a lot of rain on the island, even on the wetter windward (eastern) side. 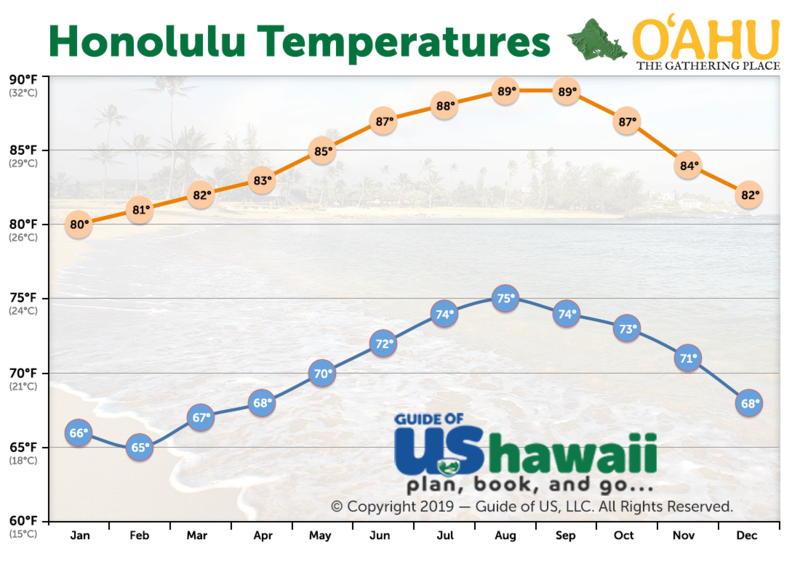 That said, let's take a closer look at what the weather is like on Oahu, as this will help you decide where to stay during your vacation or trip. Our Where to Stay on Oahu article may also prove useful in helping you select a region, and for more information about when to visit the island, be sure to check out our When to Visit Oahu page. "Great weather" is often defined as sunny and warm - and if so, Oahu is definitely a place for great weather. Luckily, the majority of the accommodations on Oahu are in very dry and sunny locations. Most can be found in Honolulu or the Waikiki area, which only averages about 20"-40" (50-102 cm) of rain annually. We should point out that even in the wettest locations on Oahu (on the East Coast along the Koolau Range), rain is hit and miss. One minute it may be raining, and the next the sun is back out - usually along with a beautiful rainbow! 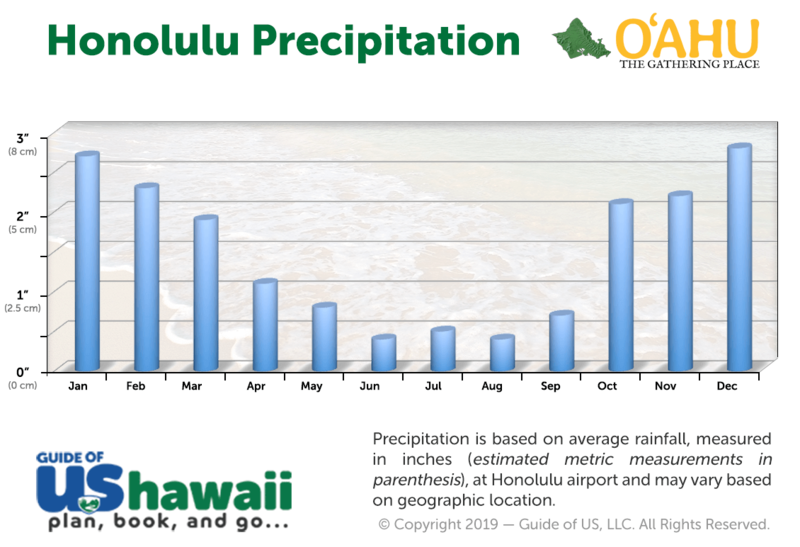 The wettest periods on Oahu are almost always in the wintertime when the tradewinds bring additional moisture to the islands. This period runs from mid-November through late March on average, and some of these systems can carry quite a bit of rain. This isn't to say Oahu isn't nice during the winter months; it is- but it's also going to mean the likelihood of wetter weather along portions of the island like the beautiful and lush East Coast. After all, it does take rain to create that beautiful verdant atmosphere. 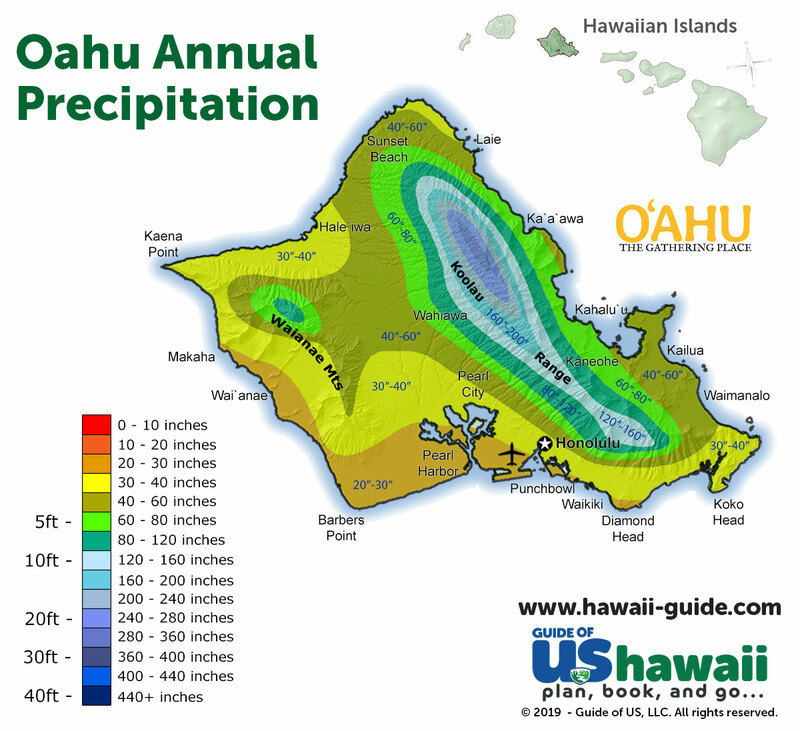 Hopefully you now have a good idea of what the weather is like on Oahu, and the map below should help you distinguish the wet from dry areas. It's really hard to select a "bad" area on Oahu, as each area is unique and beautiful in its own way. Hopefully, this information will help you decide the best region of Oahu to visit and when to go. Happy vacationing! More information about Hawaii weather can be found within our Hawaii Weather and Climate Patterns article or on our new Hawaii Weather page.